RealVison is a printing preparation application developed especially for HotRod’s electronics. While it can be used in basic mode for beginners, advanced and expert modes make it one of the most powerful tools in the market. Bluefin is the most powerful 3D Printing board available. All the speed and precision of HotRod Henry Supercharged comes thanks to its most sophisticated brains. The printer does not require a dedicated PC to run jobs. It can be located in a room completely separated from workstations, e.g. in a dedicated printing facility or a customer waiting room. You navigate through HotRod Henry’s menu using a full-color touchscreen display, which enables convenient file browsing and quick access to special functions. Printed files, configuration and updates are conveniently accessed via machine’s USB port. USB cable connection using Provided RealVision software. Built-in Ethernet. Jobs for printing can be uploaded remotely. The built-in assisted platform levelling is extremely easy and reliable. Once tone, HotRod Henry stays calibrated for long. Uses molten thermoplastic filament to deposit material layer by layer. Custom settings are possible. Although higher resolutions are theoretically possible, with current materials and technology there are no visible quality benefits from settings below 50 microns. Contains no teflon tubing or plastic parts insider the hot-end. Thermocouple instead of a thermistor provides better control and greater temperature range. For printing with carbon fiber or glass fiber reinforced materials, standard 0.35mm nozzle can be exchanged to a special 0.5mm stainless steel nozzle. It takes less than a minute to switch to a different nozzle size or to a different material, without changing the calibration of the Z-height. Heated build plate enables printing materials such as PLA and PET without any need of adhesion aids. Heated Textile composite plate enables printing polyamides (Nylon) without tape or glue. Plywood plate secures adhesion of some high temperature materials such as POM. Compatible with all materials available in a form of 3D printing filament. No exceptions. Currently the most popular standard out there. Essential for printing without special adhesion aids. Keeping heat inside the build space, ensures no warping or cracking when using more demanding materials. The build plate surface is replaceable. 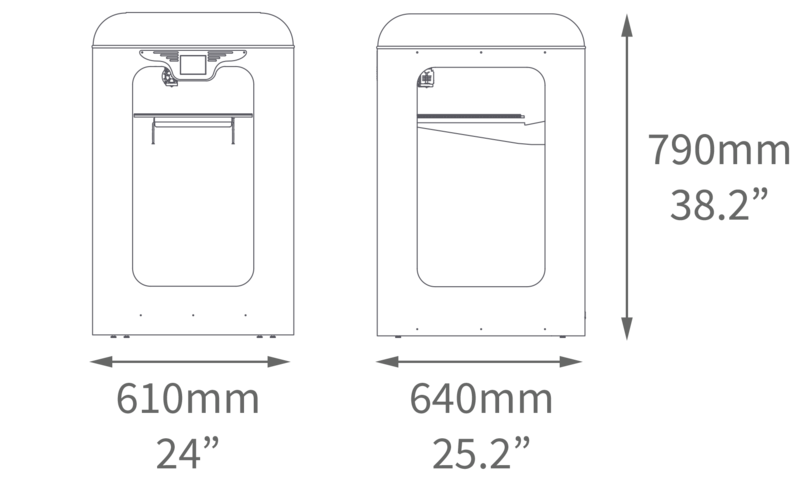 As standard, a glass surface is installed, but can be changed to any other 360mm x 360mm plate according to your needs. The heating function remains operational regardless of the plate being used. Internal feeding system prevents dust or excessive moisture access to material currently used. Coming soon – dedicated feeding cabinet. Standard finish: Aye-vory off white powder coating. Custom color schemes available as options. Top cover comes in either pure white or glossy black finish. Windows and doors are included. They are not required for operation. However, we recommend closing the build chamber for specific materials. HotRod Henry Supercharged is nearly an all-metal construction. There are no low tempetature or sensitive plastic parts within the build chamber. CoreXY concept allows to maintain light weight moving plates while keeping motors stationary. This reduces inertia of moving elements. Also, a full CoreXY implementation prevents unwanted rotational forces that reduce longevity and increase friction. When motion smoothness and mechanical stiffness count, nothing comes close to proper linear rails. We use industrial grade, precise linear guides innstead of shafts. This ensures no play and longevity, especially for high speed applications such as HotRod Henry Supercharged. NEMA 23 motors are a step up from industry standard NEMA 17 motors regarding torque and ability to stay cool. HotRod Henry needs much more torque than most printers to achieve declared speeds. X, Y, Z motors are located outside the printing area, therefore they are not exposed to excessive heat. Extruder Motor is located in the chamber, but its currents are low. Optional radiator or liquid cooling can be installed on demand. Depending on the options, the device is either multi-system, or is prepared for specific voltage upon request. Actual power consumption during operation may vary depending on the printing temperatures and printing speed. Power consumption at idle can also vary depending on whether the motors are set in holding or released mode. Copyright © 2016 Aye Aye Labs Ltd. All rights reserved.